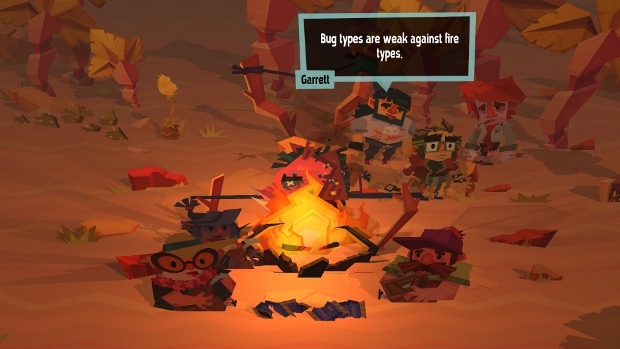 A common thread in new school adventure and role-playing games is the emphasis on player choice, with an implied promise that through individual decisions players can build a unique narrative. In practice, that often produces choices that feel important in the moment but do not actually alter the overarching plot in a meaningful way. Events diverge a bit in the middle, but converge again so everybody ends up in the same place. Dyscourse strives to make good on the promise. It plays out like an old Choose Your Own Adventure book, where two runs through can end in different places with different characters, all determined by protagonist Rita's choices. 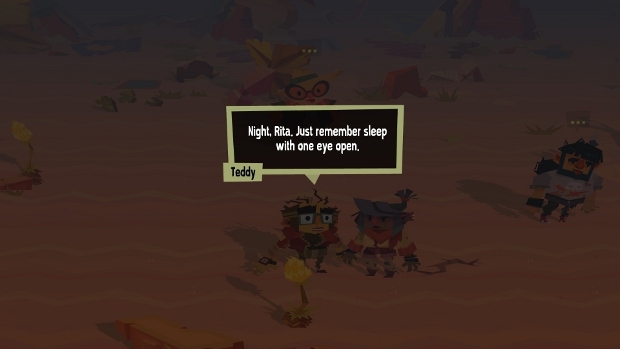 Rita is one of the six characters to survive a catastrophic plane crash on a desert island, and she functions as the only sane person in the group. George and Jolene are an older couple on the verge of divorce, Steve is an ultra-pessimistic corporate drone, Teddy is a paranoid conspiracy theorist, and Garrett is a gamer out of touch with reality. Each cast member is distinct, both in voice and back story. This serves to keep scenes interesting, even after the second or third time experiencing on, but it does suffer a bit in believability. Teddy and Garrett have some of the best lines, but they are such caricatures that it's difficult to take the whole thing seriously. Playing through one story takes roughly an hour, spanning about ten in-game days. In contrast to other choice-driven narratives (Mass Effect, Telltale titles), Dyscourse is built to be played multiple times. Not only is it short enough to warrant that, but it branches in such a way that experiencing all of the main plot lines would take at least three separate runs, and seeing everything requires even more. 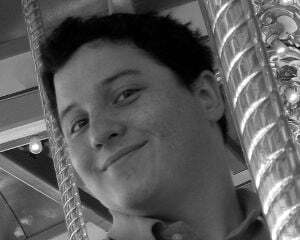 Between the crash and the end, characters can will die. Additionally, several modified pigeonhole principle situations come up: four characters are present but only three can fit on a raft, three are on the raft but there is only enough food for two, and so on. The result is that certain scenes can be experienced with several different combinations of characters, and the outcomes of those scenes may vary depending on who is present and in what physical and mental state. One such scene had Rita and Steven striking out to find food and coming across an abandoned military outpost. It is padlocked shut, but Steve has a hidden talent for lockpicking, so the duo can gain access. For those curious how the scene would have played out if, say, Garrett had come along instead, Dyscourse includes a "Day Rewind" feature that allows players to go back to the beginning of each day to see what would have happened if another option had been chosen. It's not quite as robust as I would have liked (some sort of functionality that visualizes or otherwise keeps track of which branches have already been chosen would have been great), but it's a nice addition nonetheless. In an example that shows how much certain decisions actually matter, one of my plays through had Rita fighting a jaguar and losing an arm. Later on, when it came to the big decision point opening the second act, one of the options was entirely locked out; Rita wouldn't be able to climb the mountain with only one arm. Less obvious examples pop up throughout. Though each of the other survivors is generally unhelpful and inept in most cases, each appears to have some special skill to help get through a particular situation unscathed. I'm convinced that there must be a way to leverage that perfectly in order to get all six survivors off the island, but after three and a half plays, I haven't found it. Though I have only managed to rescue three of six every time, I do feel like I am getting closer, gaining knowledge over time that can lead to a perfect run. Maybe I'm chasing ghosts. Special mention should be given to the sound design. The soundtrack never takes center stage, but it complements the part silly, part serious life-and-death adventure. Steel drums evoke the tropical setting without being too upbeat. Characters speak in Animal Crossing-esque warbles, allowing for the divergent storylines without requiring a huge volume of voice work. Dyscourse set out to be an adventure game in which player choice has significant effects on where the narrative goes. To that end, it succeeds. As a relatively short experience, it encourages players to replay, learning new information with each new choice. As a result of that, no one play through feels like a "true" one. Despite being so full of death and despair, it lacks the expected emotional weight, partly because of the cartoon presentation but mostly because there's always the option to try again and see what can be done differently. That said, each story crafted is fun and sometimes funny. Watching an early decision ripple out to future consequences, then rewinding and seeing what would have happened if something else were chosen is an entertaining exercise. I'm going to keep playing at least a few more times until I see all of the different scenes and maybe even find my true story.